When we think of saints who have promoted devotion to the Sacred Heart of Jesus, we often call to mind the Visitation sister St. Margaret Mary Alacoque and her confessor St. Claude de la Colombière, S.J. And that is for good reason. Although, prior to her, there had been a long history of devotion to the heart of Jesus which was practiced by others such as St. Catherine of Sienna, it is through St. Margaret Mary that the devotion became more widely known and practiced. Over the course of eighteen months, beginning on December 27, 1673, St. Margaret Mary received several visions of our Lord in which she received information about the form of the devotion and a call to promote the devotion to the Sacred Heart. After much resistance to her efforts to fulfill this mission to promote the devotion, she finally received support from St. Claude who believed that the visions were genuine. Following her death, the devotion grew in a large part due to the spreading of the the message of the Sacred Heart by the Society of Jesus. 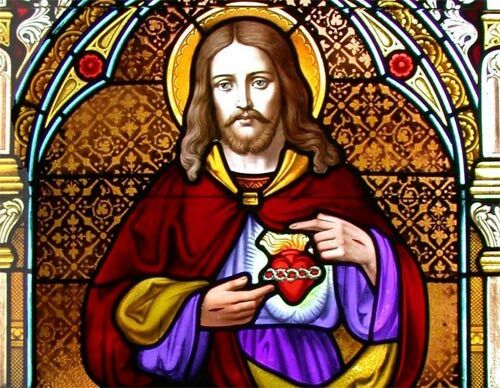 What is perhaps a lesser known story about this popular devotion is how the consecration of the whole world to the Sacred Heart of Jesus was accomplished in 1899. The story involves a princess who became a nun, the Holy Father being healed from an illness, and the sister’s obedience to our Lord’s wishes. 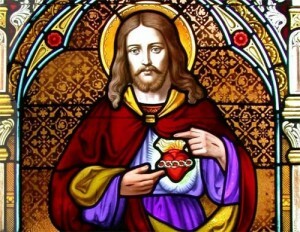 Through the faithfulness of Blessed Maria of the Divine Heart, Pope Leo XIII consecrated the world to the Sacred Heart of Jesus shortly before the Twentieth Century. Maria Droste zu Vischering was born to a pious and wealthy family in 1863. As the child of nobility, she was raised in a castle in Rosendahl, Germany. She lived the life of a princess although she herself was somewhat of a tomboy. She would run and play outside until her clothes were filthy and she needed a change from head to toe. Bl. Maria had a strong will and a temper to match it. She would have outbursts of anger directed at her siblings and mother such that she earned the nickname “The Little Wildcat”. Due to pneumonia, she left the school and remained at home in order to recover from her illness. During the time of her illness, she heard within her heart, Jesus say, “Thou shalt be the wife of My Heart.” The call surprised her because she knew who she was and did not consider herself someone who would be worthy of this grace. In response, she tried to live the life of a religious within in her own home. She lived simply with less furniture in her room and kept to a schedule modeled after the life of a nun. It was noted, however, that she was not so resolute that she would not take time to break her schedule to hear the family news and local gossip. It was also during this time that she kept a precious statue of the Sacred Heart of Jesus. Finally, in obedience to the Lord’s calling, she joined the Congregation of Our Lady of Charity of the Good Shepherd in Muenster in 1888. When she received the habit the following year, she received the religious name Maria of the Divine Heart. It was an unusual religious name for the congregation, but it delighted Maria to receive it because of her devotion to the Sacred Heart. Her desire was for the contemplative life, and she had to learn that through her work, she was able to express her devotion to Jesus. Bl. Maria was very skilled at working with the young girls and women who were the focus of the congregation’s apostolate. She served as a doorkeeper, teacher, and caregiver to the girls who were entrusted to the congregation. She was drawn to the most troubled ones, and through her compassionate heart, she helped them through their difficulties. Humbly, she attributed her abilities to the Sacred Heart of Jesus. In 1894, she was sent by her congregation to join its mission in Porto, Portugal. The mission was troubled with a lack of devotion, discipline, and finances. Bl. Maria started to learn the language and help the mission move in the right direction. The young girls and women whom the congregation served viewed her as a dear mother, and as her reputation spread, the locals were curious about this holy nun from Germany. Within two years, Bl. Maria was appointed the superior, and she took direct control of turning the mission around. It was quite a burden for her and she suffered much in guiding the congregation. She was also beginning to suffer from an inflammation around her spinal cord. It caused her to have severe headaches and many sleepless nights due to the pain. Eventually, her illness developed into tuberculosis of the spine. Around this time, the Lord began to request from her that she contact Pope Leo XIII in order to request that he consecrate all of humanity to the Sacred Heart of Jesus. Maria shared this message with her confessor on June 4, 1898. Later that month, her spiritual director sent a letter written by Maria to the Holy Father regarding this request. After reading the letter, the pope was unsure about the request, and he took no action. In continued obedience to our Lord and her spiritual director, she wrote the Holy Father again in January 1899. In this letter, she provided proof to Pope Leo XIII by writing about an illness he had suffered in 1898 and which the Lord had told her that the Holy Father had been healed of in order to consecrate the world. In response to this second letter with its proof of the authenticity of our Lord’s request, on May 25, 1899, Pope Leo XIII issued an encyclical Annum Sacrum regarding the consecration to the Sacred Heart. He then performed the consecration on June 10th of that year. Her mission complete, Maria did not live to see the day of the consecration. Due to her illness, she passed away just two days before on June 8th–the Feast of the Sacred Heart of Jesus. David Ward holds a B.A. in Political Science and a B.S. in Mechanical Engineering. He lives in Virginia with his wife and homeschooled daughter. In 2001, he was received into the Church. As a convert, he has developed a devotion to the saints which led to his founding Letters from the Saints (https://www.lettersfromthesaints.com/) and Daily Saints Wisdom (https://www.dailysaintswisdom.com/). He also enjoys the outdoors, gardening, cooking, and reading.